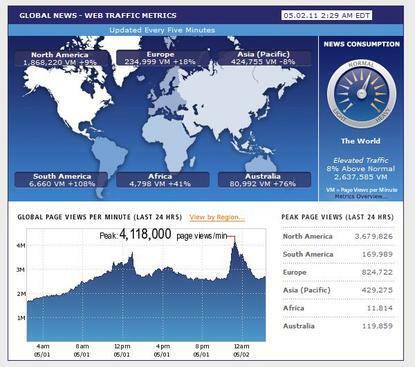 Akamai’s Net Usage Index for News, which monitors global news consumption, showed a peak of almost 120,000 page views per minute to news sites just before midday AEST. It may correspond to ‘heavy’ traffic in Australia, but it was nothing compared to worldwide figures; some 4,118,000 pages were being viewed each minute as President Obama made his speech. At 11:35pm EDT, the President addressed the US — and indeed the world — from the East Room of the White House. “Tonight, I can report to the American people and to the world that the United States has conducted an operation that killed Osama bin Laden, the leader of al Qaeda, and a terrorist who’s responsible for the murder of thousands of innocent men, women, and children,” he said. The White House has posted a transcript of the address on it’s blog, including video hosted on YouTube. The Net Usage Index is based on figures from Akamai’s delivery platform and includes more than 100 global news portal companies. The news also resulted in an immediate spike in SMS messaging around the world. Former Secretary of Defense Donald Rumsfeld’s current chief of staff, Keith Urbahn, is widely credited for being the first to break the news that Osama bin Laden had been killed on his Twitter account. Within 30 minutes, SMS traffic in the US spiked 18 per cent as people informed each other and tuned into the major TV networks, according to figures from Sybase365. The data was collected by mobile messaging company, Sybase365, using the combination of its IQ and 365 Operator Analytics.